Wild Insights, combined with Ultimate Travel’s experience. Wild Insights tours are designed for those wishing not only to see, but to savour and understand the birds and other wildlife encountered in an unrushed way. 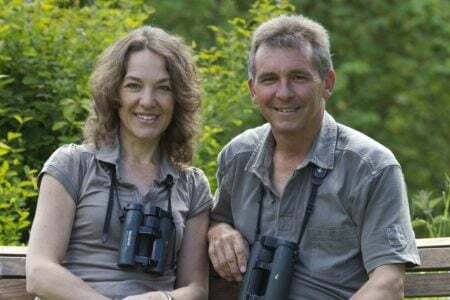 Keith and Linda Offord – your hosts and founders of Wild Insights - are both qualified zoologists with the knowledge and experience to take you to destinations both near and far and maximise your chance of seeing and enjoying their wild habitats and inhabitants. With Wild Insights, quality is always placed ahead of quantity and everyone is welcome, irrespective of experience. And now Wild Insights is part of The Ultimate Travel Company’s Escorted Tours portfolio. So you’re assured of smooth, professional travel arrangements, a meticulously researched and planned holiday and the dedicated personal attention of Keith and Linda.Wherever you go, with Wild Insights you can expect to see the extraordinary; dancing cranes and breaching whales in the Cape, dazzling tanagers and trogons in Costa Rica, vast gatherings of geese in the Netherlands, multitudes of raptors in Spain, plus dainty phalaropes and mighty Gyrfalcons in Iceland. Details of all fully costed tours can be viewed below. Wild Insights tours are very popular and advance registration with a £50 returnable holding fee enables you to register your interest as soon as the tour is announced. The following tours have been confirmed but details are yet to be fully finalised.